These issues contain valuable scientific articles and clinical reports and symposia that we wish to make accessible to as many people as possible. Many thanks to IOS member Stergios Tsiormpatzis for scanning the high-quality pdfs. (Please note – bound hardcopies of these two issues can still be ordered for your personal library as long as they remain in print). “Studies of the Reich Blood Test in Cancer Mice,” by C. F. Baker and R.A. Dew, pp. 1-11. The results of 57 Reich Blood Tests in a cohort of 17 C3H/OIJJ spontaneous mammary tumor mice are presented. Findings in tumor-free normals and tumor-bearing females are compared, and a statistical analysis of the energetic indices, i.e., the 1% time, GMA, and various other parameters, is made. While confirming the significance of certain observations previously made by Reich and the authors in human subjects, there are dissimilarities between the diatheses in the mice and human cancer that suggest the mammary tumors may not be the result of a shrinking biopathy. “The Effects of Calcium on Preparation 6,” by C.F. Baker and P.S. Burlingame, pp. 12-17. This paper summarizes some of the quantitative and qualitative effects on Reich’s bion preparation 6 by the addition of calcium in various concentrations. Earth bions were added to preparation 6 solutions and the charge on the bions assessed in the presence of various calcium concentrations over a period of several weeks using the technique of bion migration. Clear-cut initial inhibition of bion migration was found at high calcium concentrations, but little benefit appeared to result at lower concentrations. “Human Armoring An Introduction to Psychiatric Orgone Therapy, Chapter 1: What is the Cure? What is the Disease?, Chapter 2: The First Session – Observation, Chapter 3: The Concept of Armoring,” by M. Herskowitz, pp. 18-34. “The Ocular Character,” by D. Schwendeman, pp. 35-42. The energetic qualities and character traits shared by ocular characters are discussed. Wilhelm Reich’s research is reviewed to define the ocular character type and to demonstrate the biological basis of ocular pathology. The effect of this biologic disturbance on subsequent psychological development is then summarized and the personality traits commonly seen in ocular characters are discussed. A clinical example is employed to review salient features. The classification of ocular characters is also considered with some brief comments on the diagnosis of schizophrenia. “Clinical Symposia: The Ocular Segment, Part III,” pp. 43-49. 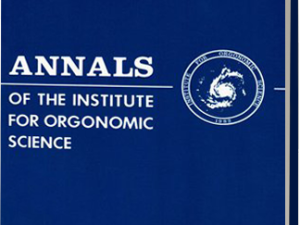 The Clinical Symposia contain edited material from the training seminars of the Institute and are intended to provide the readership with information regarding the theory and practice of orgone therapy. In this installment, nine orgone therapists conclude a discussion of the ocular armor segment. “The Amateur Scientist in Orgonomy: Orgone Energy and Plant Life,” by J. Espanca, pp. 57-62. 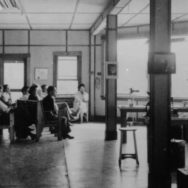 This column is intended to encourage “ hands-on” experience with various aspects of Reich’s biological and physical laboratory findings, particularly for interested readers with limited means or access to sophisticated equipment. Each issue will feature an experimental research project that illustrates basic orgonomic findings using only modest equipment and expertise. Readers are encouraged to submit their own projects, including a brief theoretical background, a detailed practical description, references for further reading, and relevant diagrams or charts. It must be a project actually carried out as described rather than a theoretical design. In this installment, an experimental study of the effect of dry tomato seed treatment with the orgone energy accumulator over two generations is described. The greatest mean yield per plant, mean number of fruits, and mean fruit weight was found in group O-O plants, whose seeds derived from orgone accumulator treated plants from the previous year, and which were also treated with the orgone accumulator before planting, when compared with either C-O plants, whose seeds were not derived from orgone treated plants but which were treated with the orgone accumulator prior to planting; O-C plants, whose seeds derived from orgone accumulator treated plants from the previous year, and which were not treated with the orgone accumulator before planting, or C-C plants, derived from seeds which were not treated with the orgone accumulator in either year. Although no statistical analyses were applied to the data, the results raise the intriguing possibility that biological effects of the accumulator can be cumulative over two generations. “Energy: An Overview,” by C. F. Baker, pp. 1-14. Energy is normally defined in terms of mechanical work, and exists largely as a mathematical construct in classical formulations. However, its ultimate source lies not in matter but in the dynamic, spontaneously moving orgone energy continuum. This paper is a preliminary attempt to formulate a unifying concept of energy based on the centripetal flow of energy from the medium. “An Air Germ Experiment,” by R.A. Dew, pp. 15-43. An experimental protocol to determine the presence of airborne protozoal cysts is presented. The premise of the study is that, if the protozoa found in grass infusions are due to these cysts, then culture media proven to support the growth and reproduction of the same organisms should yield these forms simply on exposure to the air, without the addition of grass clippings. Two years of accumulated data and observation show that the protozoa of the grass infusions do not appear in the artificial media, thus contradicting the assertion of the air germ theory. Furthermore, the study confirms Reich’s work on the organization of protozoa from bion vesicles. A new finding—the formation of various amoebae from heaps of bacterial cells—is described, and its pertinence to other experiments by Reich is discussed. 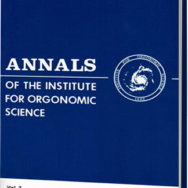 “Effect of the Orgone Accumulator on Potato and Onion Plants,” by H.J. Claymond, pp. 44-48. This paper reports on five years of experiments using potato tubers and two years using onion sets to determine the effects of orgone energy accumulator charging on plant growth and yield. Although a response to orgone accumulator charging was not found in every growing season, the results of the experiments provide evidence that the orgone energy accumulator may affect plant growth and yield. The effects due to orgone accumulator charging were generally beneficial; however, a negative effect on onion growth and yield was observed in one growing season. Energetic Vitality,” by I. Bauer, pp. 49-65. The following study introduces a new parameter, the Sedimentation Index, for the measurement of energetic vitality. The procedure that measures it was patterned after the conventional laboratory test known as the Erythrocyte Sedimentation Rate and has an advantage of being easily quantifiable. Over a four-year period, 1,100 patients with a wide range of pathology were studied by correlating their sedimentation indices with their energetic appearance and clinical diagnoses. The results of the research proved to be statistically significant. “Human Armoring An Introduction to Psychiatric Orgone Therapy, Chapter 4: The Segmental Armoring,” by M. Herskowitz, pp. 66-87. “The Biopathic Diathesis in the Treatment of the Ocular Segment,” by B.S. Braid, pp. 88-92. The treatment of ocular segment pathology in a 23-year-old female patient who presented in a suicidal crisis is described. Gradual improvement in some of her symptoms was noted over the course of several years treatment. “Clinical Symposia: Hysteria,” pp. 93-102. The Clinical Symposia contain edited material from the training seminars of the Institute and are intended to provide the readership with information regarding the theory and practice of orgone therapy. In this installment, ten orgone therapists discuss the diagnosis and treatment of hysteria. “The Amateur Scientist in Orgonomy – A Grass Infusion Project,” by R.A. Dew, pp. 107-117. This column is intended to encourage “hands-on” experience with various aspects of Reich’s biological and physical laboratory findings, particularly for interested readers with limited means or access to sophisticated equipment. Each issue will feature an experimental research project that illustrates basic orgonomic findings using only modest equipment and expertise. Readers are encouraged to submit their own projects, including a brief theoretical background, a detailed practical description, references for further reading, and relevant diagrams or charts. It must be a project actually carried out as described rather than a theoretical design. This installment describes procedures employed for replication of Reich’s experiments on the natural organization of protozoa from bionously disintegrating grass infusions, including recommendations for microscopy, preparation of the infusions, special slide mounting techniques for prolonged observation of living material, and a detailed description of how to distinguish between natural organization, encystment, excystment and simple contraction of protozoa. The Trust urgently needs to raise money to secure the long-term future of the Reich Archives. This collection has been kept at the Countway Library of Medicine in Boston since 1977 and is so important as a repository of Reich’s diaries, films, audio recordings, laboratory notebooks, correspondence, unpublished manuscripts, and many other items. Several dozen scholars have done research in this collection since they were opened to the public in November 2007. In order to preserve this collection for all time it needs to be digitally entered, item-by-item, into the Countway’s online catalog as soon as practically possible. Countway archivists have estimated this will cost $90,000, which we must raise as quickly as we can. Digitial imaging of the entire collection is the next goal, to guarantee its safety in the event of flood, fire, theft, etc., as well as to make most of the collection available online, to greatly increase scholarly access. The cost to digitize these priceless scientific and psychiatric discoveries and innovations is estimated at an additional $360,000 on top of the cataloguing expenses. We must raise these funds as promptly as we can, particularly the first $90,000. Any tax-deductible contributions you can make to the Wilhelm Reich Infant Trust, earmarked for the Reich Archives Preservation Project, are most welcome. Bequests on behalf of this important collection are also deeply appreciated. And anyone who values the preservation of Reich’s legacy, please bring our cause to the attention of private philanthropic foundations, such as Family Foundations, or put us in touch with them. Over the next few months, we plan to make back issues of these ten early issues available as free pdf downloads. These issues contain valuable scientific articles and clinical reports and symposia that we wish to make accessible to as many people as possible. Many thanks to IOS member Stergios Tsiormpatzis for scanning the high-quality pdfs. (Please note – hardcopies of some of these issues can still be ordered for your personal library as long as they remain in print).